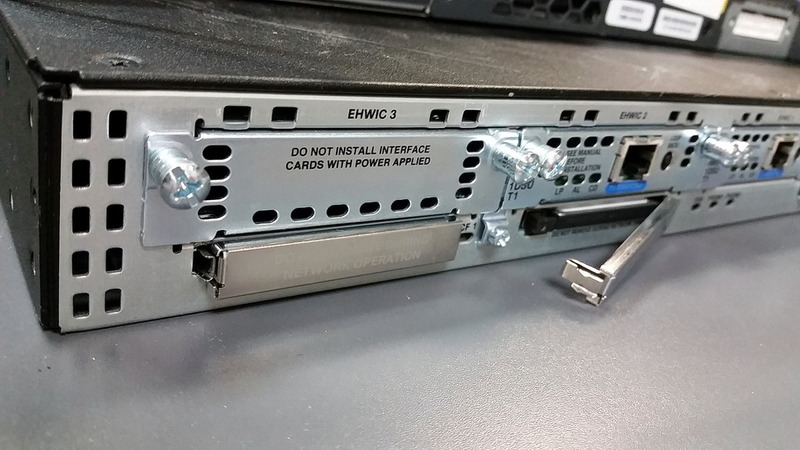 I have to reset one Cisco 2901 router to factory default. Unfortunately no one knows user name and password. Cisco documentation Password Recovery Procedure for the Cisco 2900 Integrated Services Router has listed all steps, but not enough detail how to "Remove the compact flash that is on the rear of the router." 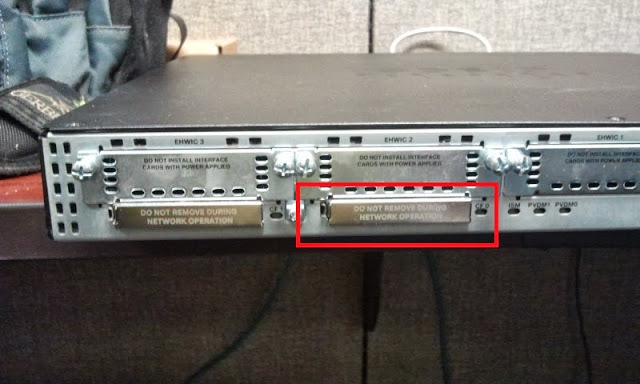 I understand Cisco 2900 series is using a different way to do password recovery than a usual way by press 'Break' key during booting process. 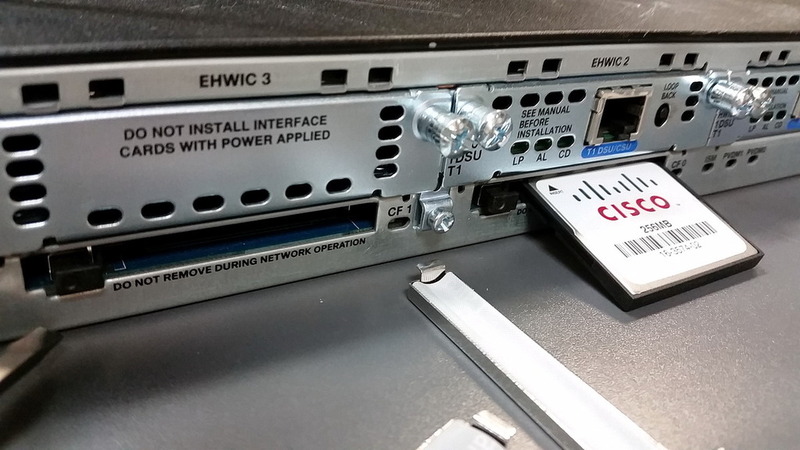 Cisco 2900 will automatically boot into ROMMOM mode after you removed Compact Flash card. 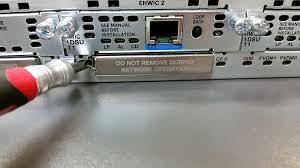 But how to remove CF card from the rear of router, it does not say enough from Password Recovery Procedure for the Cisco 2900 Integrated Services Router. There are two CF slots. The right one is 0 which usually holds CF inside. Before you process to remove CF slot cover, turn off your router first. Using a flat head screwdriver to plug into the cover spring place as show in the next photo, slightly push and pry it a bit to left. The CF slot cover can be lifted out. After removed the cover, you will see CF is securely plugged inside. Taking CF card out will be quite easy now. Basic steps to do 2900 router's password recovery. After boot into ROMMON mode, change config-register value to 0x2142 to ignore startup-configuration during next boot process. Rounded IOMEM up to: 44Mb. Cisco CISCO2901/K9 (revision 1.0) with 479232K/45056K bytes of memory. After logged into enable mode, copy startup-config to running-config. You may get some warning messages, but they can be ignored. % Hostname "Test-Test- " is not a legal LAT node name, Using "CISCO_4269D0"
*Jun 3 20:09:12: %SYS-6-CLOCKUPDATE: System clock has been updated from 20:09:12 UTC Fri Jun 3 2016 to 20:09:12 GMT Fri Jun 3 2016, configured from console by console. Change enable password and add a new user admin into configuration. The enable secret you have chosen is the same as your enable password. This is not recommended. Re-enter the enable secret.